I grew up in a small Colorado mountain town. The area was well known for its large ski resort, and each year thousands of people from all over the country would come to carve out their own section of the slopes. I was terrible at skiing and snowboarding (I felt most comfortable on a snowmobile), but I remember traveling up to the resort on numerous occasions just so I could watch all of the skilled riders make their way down the steep mountainside. It was so impressive to see people effortlessly glide across the powder, and I remember staring intently and waiting for some brave soul to attempt a trick. Because of this, I always had to have the latest and greatest winter sports video games. I loved titles like SSX, Amped, and Shaun White Snowboarding, but most games within the genre lacked the “freedom” that comes with real-life skiing and snowboarding. A new release by Ubisoft, dubbed Steep, is aiming to change that. Steep is the culmination of all the downhill games I loved from childhood. It possesses a solid mixture of “realism,” and blends it perfectly with video-game style tricks and stunts. The controls are pretty tight, and the gameplay mechanics feel polished. You should find a lot of entertainment value in carving down the mountainside at full speed, hitting as many jumps and rails as possible. But the true grace of Steep comes from its massive open world. There are tons of drop locations to start from, and you’re virtually untethered as you make your way around each area. You can even discover new drop locations by venturing into unknown lands and using your binoculars to spot them. It’s a clever way to open new areas and it makes it feel as if you’re actually exploring the snowy terrain on your own. This exploration is where the visual beauty of Steep really shines. The environment and character design are expertly rendered. There is a stark sense of realism through as you progress along the dense mountain range. Tall trees flank wide open slopes, while man-made structures and log cabins nestle inside valleys. I spent a majority of my time simply exploring the towering peaks, just to see all of the eye candy that developers crammed into each area. The art team did a fantastic job in crafting an immersive world that looks and feels like an untouched winter wonderland. You’ll feel as if you’re part of an exclusive group that was allowed access to this beautiful area. Once you calm your senses, you’ll be able to truly appreciate what Steep offers in terms of gameplay. There are so many things to do that it can seem overwhelming at first glance. Steep isn’t just about exploring through the snow. 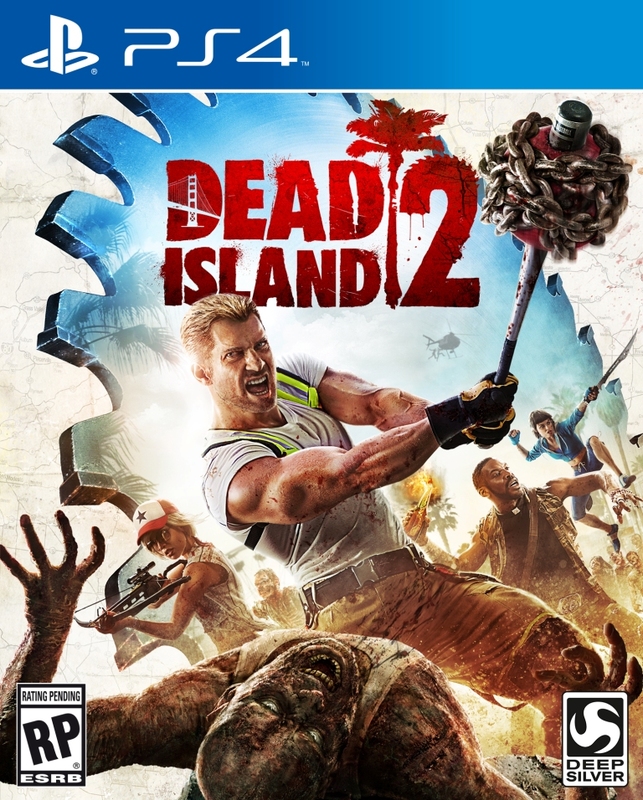 At its core, you’ll find a game brimming with events and creative gameplay mechanics. This is all made more exciting by the fact that you can freely “switch sports” on the fly. 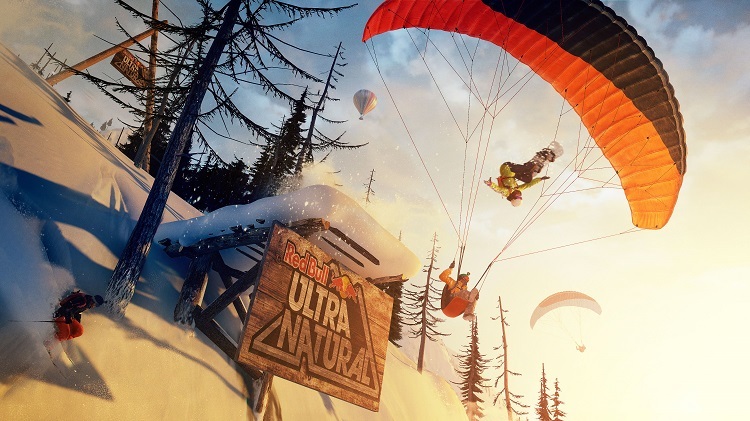 You can dabble in snowboarding, paragliding, skiing, or zip through the air via a wingsuit. Being able to freely swap between these devices gives you the freedom to explore areas as you see fit. If racing is your forte, you can compete against friends and foes through a seemingly endless number of course configurations. You’ll need to slide through checkpoints along the way, and there are many areas which give you the freedom to “create your own path” as you speed down the mountainside. Racing through the snow isn’t the only way to sate your lust for speed, either. There are many courses and races designed for parachuting and wingsuiting. The ability to race through a variety of sport types really helps to break up the monotony. Those of you interested in the “trickier” side of skiing and snowboarding will find an abundance of freestyle events. Some events will take you through specially designed parks, filled with obstacles and man-made jumps. Other events have you performing as many tricks as possible while you race down a back-country area towards a designated checkpoint. 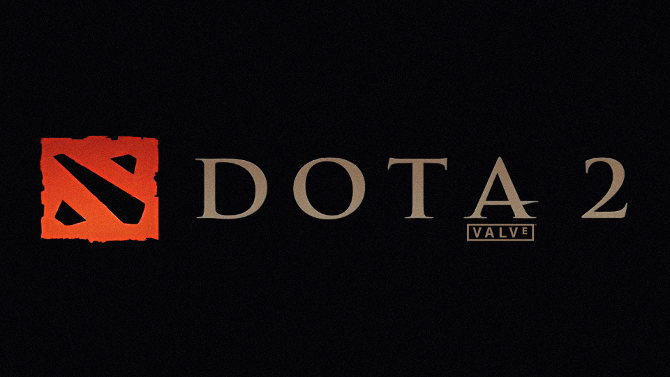 Developers worked hard to create a multiplayer experience that feels truly epic, and I am happy to announce that they managed to do a rather fantastic job. You’ll be able to explore the open world with friends, and embark on adventures through deep powder and icy hilltops. This vastly improves the overall entertainment value for Steep. There is a lot to do and see in this winterized world, and everything is made much better when traveling in a group. To add to an already impressive amount of replayability, you’ll be given access to tools that can help you craft your own events and challenges. You can start from a specific drop point and carve your way through virgin terrain. Once you’re satisfied with a particular path you can select a specific starting point and create races and trick challenges. You’ll also find a rather impressive set of replay tools, allowing you to save moments and share them with friends. There is also a nice amount of visual character customization. You can purchase new outfits, boards, suits, and skis by leveling up and purchasing them via in-game currency. Steep is available right now on Steam, Xbox One, and Playstation 4. 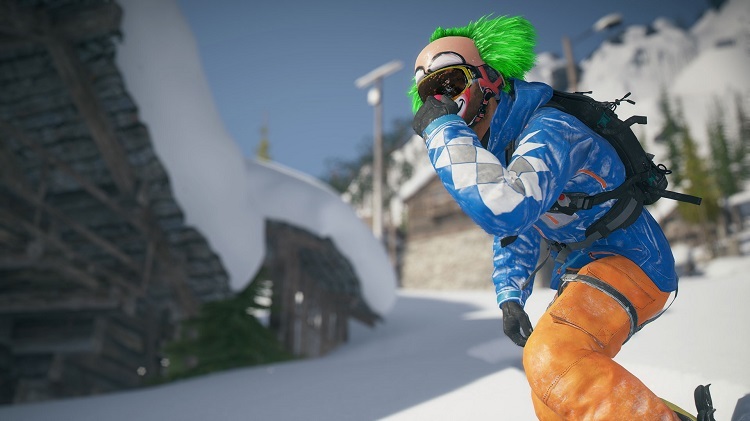 This is definitely a good addition to the winter sports world, and can be a lot of fun if you’re itching to indulge in some virtual skiing and snowboarding. It will be very interesting to see what Ubisoft does for future DLC packages, and if the new additions will keep the community’s attention. This is definitely the type of game that would be a riot with friends, but there is a solid amount of content to enjoy here if you’re playing solo. Keep in mind that you’ll also be able to make new friends and interact with players in an “MMO-like” setting. For more information regarding Steep, be sure to check out the dedicated website here. You can also follow developer Ubisoft on Twitter and Facebook.